Adidas Pure Game is specially designed for sporty and courageous man. 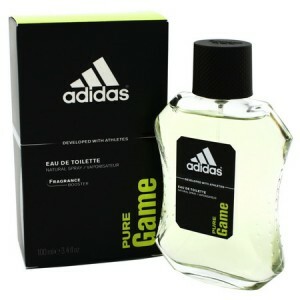 Adidas Pure Game 100ml. Eau De Toilette is specially designed for sporty and courageous man. Inspiring and varied scent promotes feelings of excitement and joy of the game evokes the teamwork and provides perfect freshness even during demanding sport performance. Her lush tones underline the charisma of each athlete. The actual beginning of perfume Pure Game opens up fresh basil leaves and juicy grapefruit chords and peppered mandarin. Captivating tones pervade the heart of a unique cypress wood chords and captivating essence of lavender. Unique conclusion completes tonka bean, aromatic incense, exotic patchouli and precious sandalwood. Sports men's fragrance Adidas is specifically designed for your physical activity. Recharge and go into the game with an exclusive men's fragrance Pure Game by Adidas! This eau de toilette is a kind of anthem of masculinity, courage and strength. Embodying the game, speed and victory, she recalled that the sport - game, style, image and meaning of life. Adidas brand dedicated his perfume creations games, still a popular sport collection Game. After applying the perfume composition manifests top notes of mandarin and grapefruit, Tuscan basil and pepper. Then, the game enters a harmonious combination of patchouli leaves, incense, tonka bean, wood tar. Perfumers have given the opportunity to feel the dynamics, strength and energy of the sport, to win a long-awaited victory in their endeavors, which relate to career and personal life. Adidas Pure Game represents a beautiful sport in which every movement of the athlete reaches the highest perfection, therefore, causes only admiration. Designed for real men: strong, hardy, active, always striving for victory in life that present success. For them there are no insurmountable obstacles to achieve their goals.